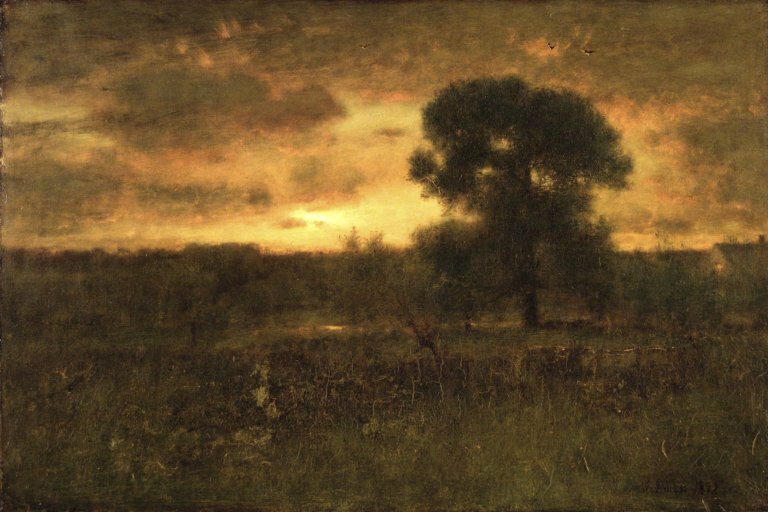 George Inness was born in 1825 on a farm just outside of Newburgh New York on the Hudson River. 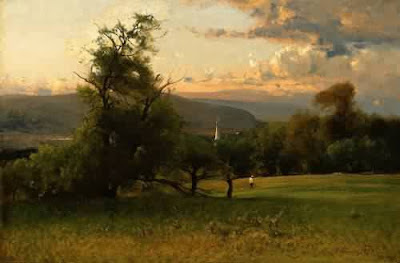 His father was a successful grocer and just after Inness was born the family moved to New York city and then again four years later to Newark New Jersey. 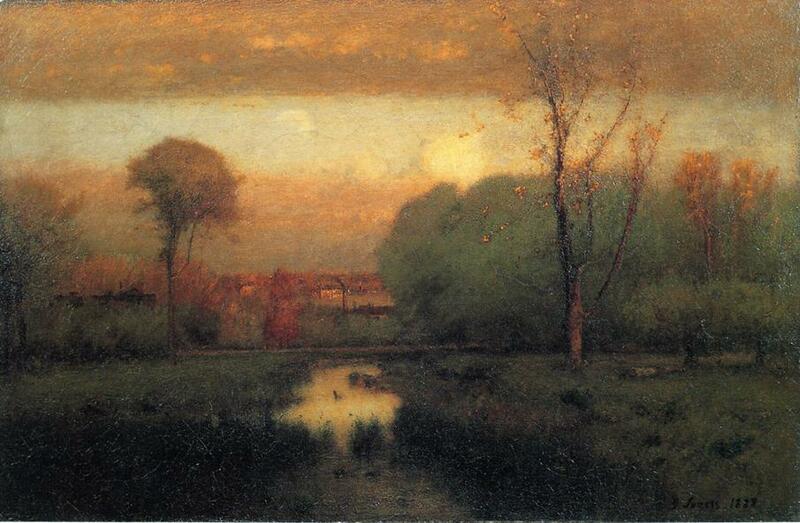 It was here Inness received his education and discovered his interest in art. 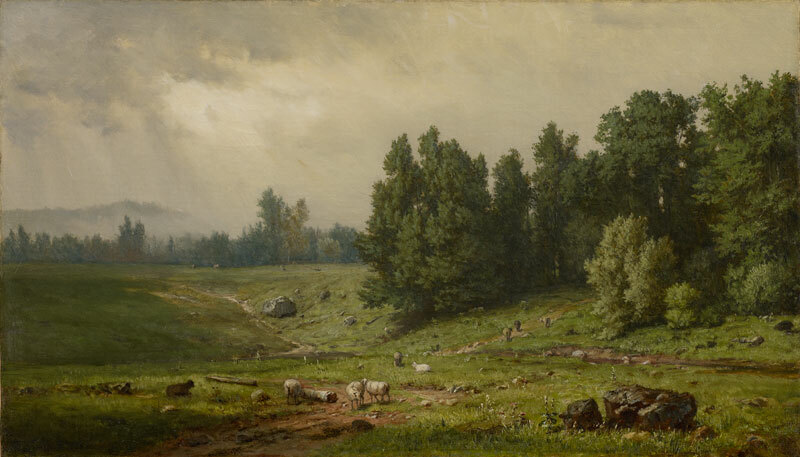 In 1839 at the age of 15 his father bought him a grocery store to manage but Inness had decided to pursue painting and his father reluctantly paid for art lessons. His first teacher was John Jesse Barker. Inness then studied engraving for two years in New York City. He studied painting for a year with French Artist Regis Francois Gignaux and attended classes at the National Academy of Design. 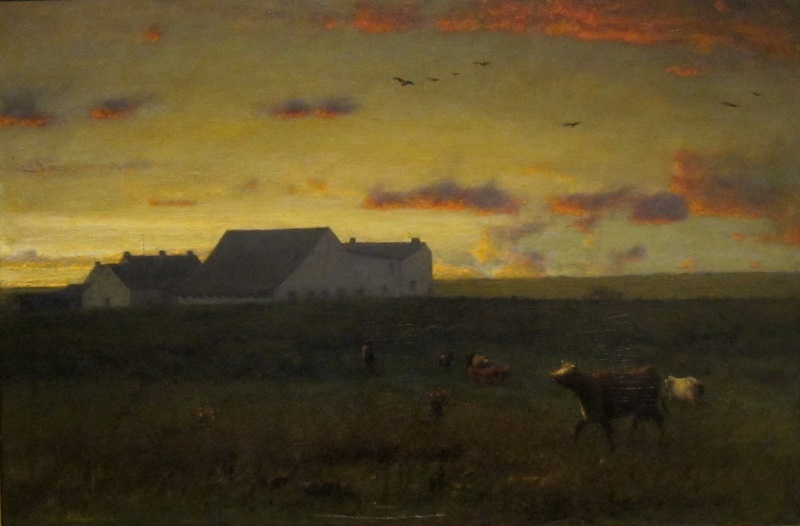 In 1849 Inness opened his own studio in New York. He also married Delia Miller who died just a few months after the wedding. He remarried Elizabeth Abigail Hart a year later and the couple would have 6 children together. In 1851 a patron sent Inness to Europe for fifteen months. 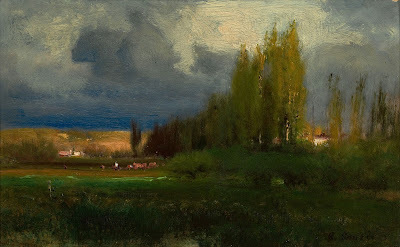 He rented a studio in Rome and studied the old masters and painted. It was probably here he became interested in to the philosophy of Swedenborgianism which held all things in nature had a spiritual relationship with God and that an artist’s perspective is influenced by this experience. His work became more ethereal in his later years using his memory and painting with a softer more emotional intent. His later work transcends the natural world touching on the poetic and sublime. 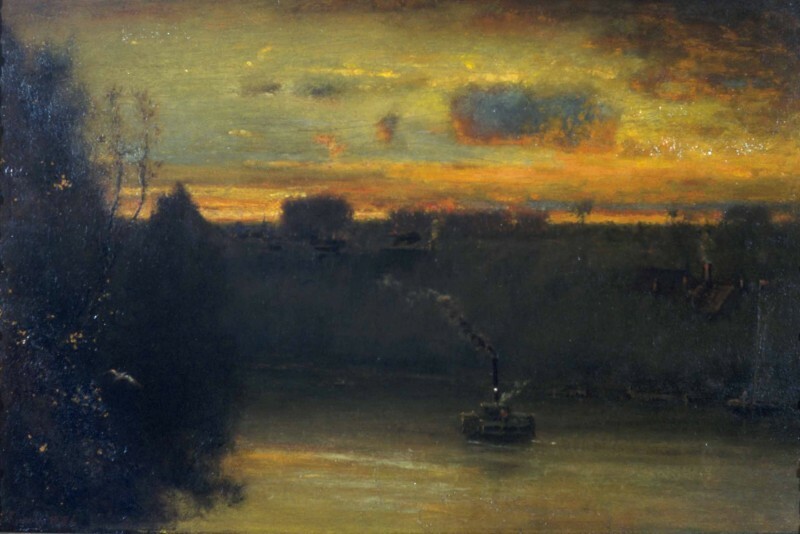 He was elected to the National Academy of Design in 1853 and became a full Academician in 1868. Inness had a retrospective show of his work in 1884 and he won a gold medal at the 1889 Paris Exposition. 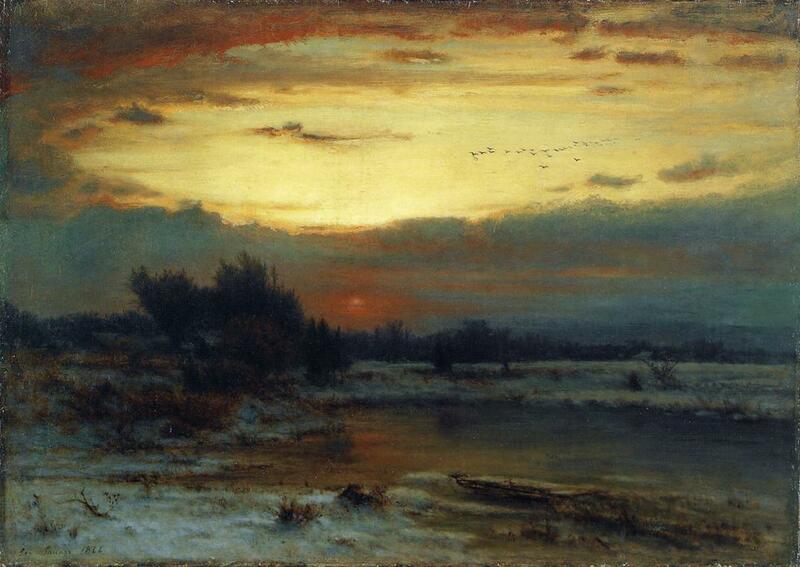 George Innis died in 1894 in Scotland after watching a sunset. Quote: The true purpose of the painter is simply to reproduce in other minds the impression which a scene has made upon him. A work of art is not to instruct, not to edify, but to awaken an emotion. Its real greatness consists in the quality and force of this emotion.